DxO PhotoLab 2.1 offers improved performance and additional camera support for the Nikon Z 7 and the DJI Mavic 2 Pro drone. 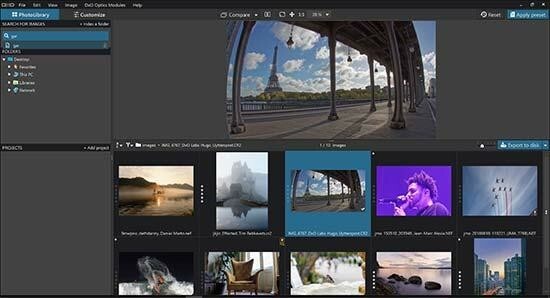 PARIS — December 5, 2018 — DxO PhotoLab 2, DxO's advanced photo editing software, which was voted Best Photo Editing Software at the 2018 TIPA World Awards, has become even more comprehensive thanks to this latest version, DxO PhotoLab 2.1. After introducing DxO PhotoLibrary, a brand-new image and data management system that lets users search for, select, sort, and display images, DxO PhotoLab 2.1 has added a file indexing feature to the macOS version of the software. The software also adds support capabilities for three new devices, including the highly anticipated Nikon Z 7 and the Mavic 2 Pro drone from DJI. DxO PhotoLab 2.1 now supports three new devices: the Fujifilm X-A5, a hybrid camera with a built-in Bayer-filtered CMOS APS-C sensor; the Mavic 2 Pro, a consumer drone from DJI featuring a Hasselblad L1D-20c camera with a 1-inch sensor; and the Z 7, Nikon's first full-format hybrid. For the Z 7, DxO PhotoLab 2's camera/lens combination database includes no less than 200 optical modules. By extension, the software also supports the NIKKOR Z 24-70mm f/4 S and the NIKKOR F FX lens, which have already been calibrated. The NIKKOR Z 35mm f/1.8 S and NIKKOR Z 50mm f/1.8 S modules will be available in early 2019. Thanks to the high-quality RAW conversion technology included in DxO PhotoLab 2 and DxO's scientific calibration process, the photos taken with these devices will be automatically corrected for any optical flaws, such as distortion, vignetting, chromatic aberrations, and a lack of sharpness. To allow photographers to apply local edits, DxO incorporated Nik Software's U Point technology into DxO PhotoLab. This local editing technology lets users perform complex selections, which used to require a significant amount of time and painstaking manual brush work, in just a few clicks. DxO PhotoLab is the only software to fully integrate U Point technology within a non-destructive RAW workflow. DxO PhotoLab 2 users can download this update for free. You do not need a subscription to use DxO PhotoLab 2. You can install the program on two computers with the DxO PhotoLab 2 ESSENTIAL Edition or on three computers with the DxO PhotoLab 2 ELITE Edition. Photographers with a license for DxO OpticsPro or PhotoLab 1 can purchase an upgrade license for DxO PhotoLab 2 by signing into their customer account on www.dxo.com. A fully-functional, one-month trial version of DxO PhotoLab 2 is available on the DxO website: http://www.dxo.com/en/dxo-photolab/download/.